A new season is upon us and with it comes a fresh schedule of events. 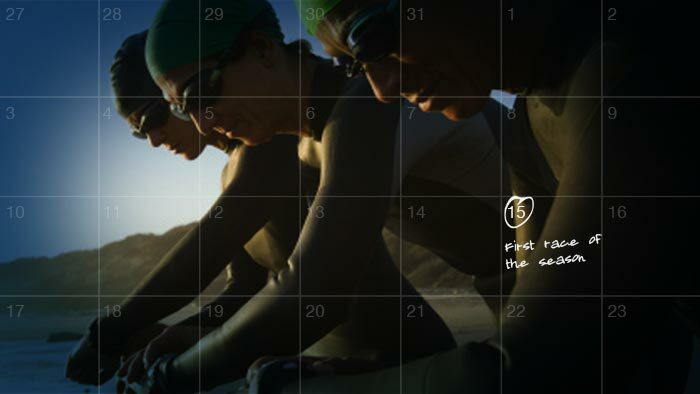 For many triathletes, your first triathlon is still a few months off, but racing is not limited to simply triathlons. The initial races of a season will mean varying things to individual athletes. This could be your first race ever, or simply the first real competition since shifting to winter mode. Everyone has their own plans and goals for their A race, and this must be considered before you select your first race of the year. While hard training sessions are good, I like to have my athletes race. There simply is no substitute for head to head competition. Racing also provides a safe, organized venue. Additionally, the added mental demands are very hard to replicate in practice. Having someone toe the line next to you will bring out the best effort in everyone. When setting up your multisport schedule, the first triathlon of the season should be a minimum of six to eight weeks before your A race, and preferably more. The first race of the season should be selected so that it provides a low-key avenue to allow you to get back into competing. Many regions have a great series of running races that allow you to have a spring run focus before multisport races get underway. Running is fantastic because it is so cardiovascularly intensive. You get a great overall fitness bump as run threshold improves. Within an 8 to 10 week window choose two to four events of varying distances leading up to a meaningful early season goal run race. This should be sufficient to nail down pacing and endurance strategies. Single sport races like running and masters swim meets can provide early season motivation. They are also a great way to see if your winter training is progressing as it should. Use your first race of the year to evaluate the process and don’t be afraid to take a chance here and there. Besides putting in a hard physical effort, the process is about mentally approaching the event with a plan. Whether it is a 10k road race or a 400m swim, mentally segment your race into quarters. During the first quarter, think about start speed and settling in with other racers. During the second quarter, maintain your rhythm and foot or arm turnover. The third quarter is always the toughest. Maintain your focus and think about technical cues. The final quarter is about guts and managing discomfort to remain strong to the finish. It’s a great way to test fitness as well as to see where pacing strategies need work or adjustment. By keeping the event local and familiar, you can concentrate on perfecting your general “racecraft”. By racecraft I am referring to how you approach the actual event. This should encompass everything regarding the race from race course recognisance and travel considerations (which may be simply a 30 minute drive in the car and parking) to your evening pre-race meal, early morning wake up call, race tactics, and more. Since your first race should be one that is not a high priority, this is the time make sure your pre-race nutrition (dinner the night before and race morning breakfast) work well for you. Along with finding the right foods, you need to dial in the timing as well. Some racers can eat only an hour before a race while others need more time to fully digest their meal. This approach should transition to you arriving at the race site with adequate time for number pick up and warm up. Perfect your technique for getting into the “Zone” (that mental state of being ready to race). Some athletes like loud music through their headphones, others prefer quiet introspection. This activation/preparation should be a rehearsal that becomes second nature. Racecraft also includes practicing your strategy of racing. You may prefer to race off the front or you may like to hang back a bit and build your pace over the distance. Some athletes work with others and use energy in a positive way, while others prefer to battle right from the outset. Practicing your strategy means that you are process oriented in your focus. Finally, racecraft includes your finish line tactics and using your strengths right to the end. Keep in mind that during early races, your event should on the lighter side to remove pressure if mistakes are made. Early season racing immerses you in this preparation and practice- and gets the rust out. Your first triathlon of the year is an excellent opportunity to have a dry run through an entire event prior to your A event. If only one race is possible before the goal event, racing on a course with similar terrain and conditions will provide a similar expected experience. This will help make sure all the boxes have been ticked during preparation and will highlight any changes that need to be made. If you have been working on swim or run speed that first race is a good test of where things stand. Again, the goals for this race are process oriented. Were you able to draft off other swimmers? How smooth were your transitions? Were you able to get the required amount of nutrition in on the bike? How does your body respond to climbing and descending? Do you need to work on handling skills? Did your body run out of energy late in the bike? How do the legs feel after getting off the bike to begin the run? Notice that all of the above considerations are what we are called process oriented goals. The idea is to focus on performing each portion of the race technically well, tuning into your body. Finally, prepare your equipment and nutrition. If you are looking to try new gear, field tests early in the year remove pressure if the equipment doesn’t work out as hoped. An early season cold water swim could illustrate the need for ear plugs and a neoprene cap during your event. Toe covers, arm warmers, and a vest on the bike can make the difference between completing the bike and shivering in the back of a support vehicle. Early season races are also an appropriate time to dial in nutrition strategies. Triathletes train a lot and racing is a nice reward and chance to enjoy hard earned fitness. Use this first race to evaluate your performance and pacing strategies and be honest with yourself. By getting a race well in advance of a goal event it will allow an athlete to make changes and improvements in preparation.